Man, how I miss those simple days when I was little and we would take Sunday drives over to grandma and grandpa’s house and sit on the front porch and just swing on the porch swing. I remember so many times going to my parents’ friend’s houses on the weekends just to visit. No watches that told you when you had a text message. No electronic device to watch movies on. Just you and the person you were visiting talking about your week, your day and what you thought were bad times in the world back then. I miss those days of feeling like I can just go and sit and talk. I have a sweet elderly neighbor that loves that and I need to do more of that. I’m sure you have people in your life that would love to have a little Mayberry time with you. Think of someone in your life who would love to have a visit to just sit and talk. Make it a point to visit them this week. Leave your phone and your talking watch in the car and just focus on them and have conversation about what’s important to them. It may be too cold to sit on the front porch, but I bet they would appreciate an ice cold cherry coke. I need to plan a little visit. Yep, I miss Mayberry, too. 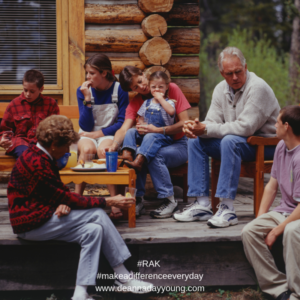 This entry was posted on February 14, 2019 with tags: #makeadifferenceeveryday, #rakweek2019 by Deanna Young.